As we blogged before, Beijing authorities have announced new regulations urging e-bike owners to register their bikes to alleviate the traffic chaos caused by unlicensed vehicles proliferating in the city. Beijing Traffic Management Bureau has released an online application channel for temporary licenses for e-bikes, as well as detailed instructions. The channel will be activated on October 31, one day before the official crackdown. So it’s highly recommended you check the instructions beforehand so that you give yourself enough time to get the required information and materials ready for a smooth application process. We’ve tried to illustrate the process as clearly as possible, but again, you might need help from a Chinese friend if you’re still struggling to follow the instructions. 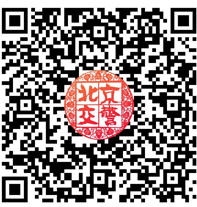 First of all, scan the QR code to download the “北京交警” (Beijing Traffic Police) app if you don’t have it. Click the “过渡期电动自行车申请临时标识工作平台” (as shown in the photo below). Select the top option “个人申请页面” (see Step 1 below), where you can check if your e-bike is listed as qualified for a permanent license by the model number of your bike brand. 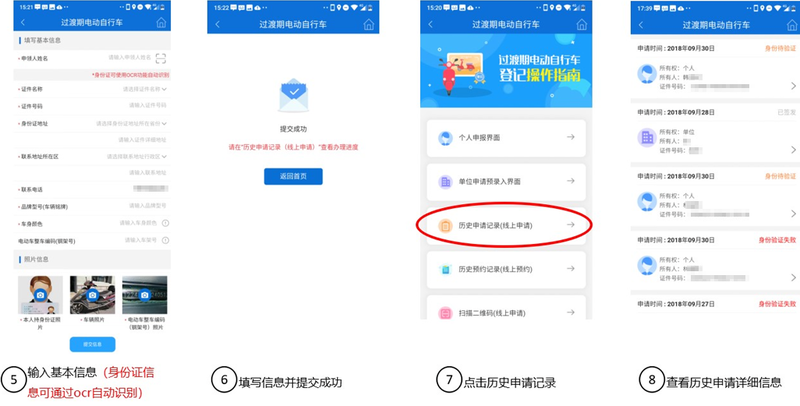 If your bike brand isn’t listed, then continue to apply for a temporary one by clicking the blue button “没有我的车辆信息，继续进行申请” (Step 2). There are two ways to apply for the temporary license – complete the whole application online, or make an appointment online to apply in person at the traffic bureau. The former is strongly recommended to save time and avoid communication difficulties with the notoriously impatient Beijing traffic bureau officers. For online application, select the left option which reads “线上申请，线下领取” (Step 3). Click the blue button in the pop-up window labeled “确认” (Step 4) to access the basic information form. and the HS (Harmonized System) code of your bike. This is a string of numbers which you can find on your certificate, or inscribed on your bike somewhere. After inputting the required information, then upload three photos: one of you holding your ID or passport, one photo of your bike, and a photo showing the bike’s HS code. After uploading the photos, you’re ready to submit the application (Step 5). To check your application’s status, you can go back to the homepage (Step 6), and click on “历史申请记录” (Step 7). “身份验证失败” means some information you put in doesn’t look right to the system and you need to redo it, while “身份待验证” means the application is being considered. If it shows “已签发”, then congratulations, you got approved for a license! Once you get approved, you can make an appointment to collect it at whichever of the 202 offices is convenient for you, within seven days of getting your application approved online. After you’ve made the appointment, the system will generate a QR code which you show the officer to get your license. The alternative is to make an appointment online to apply in person at one of these 20 Transportation Bureau offices around the city. This requires less Chinese reading skills but might involve a long wait because of the anticipated demand at these bureaus. 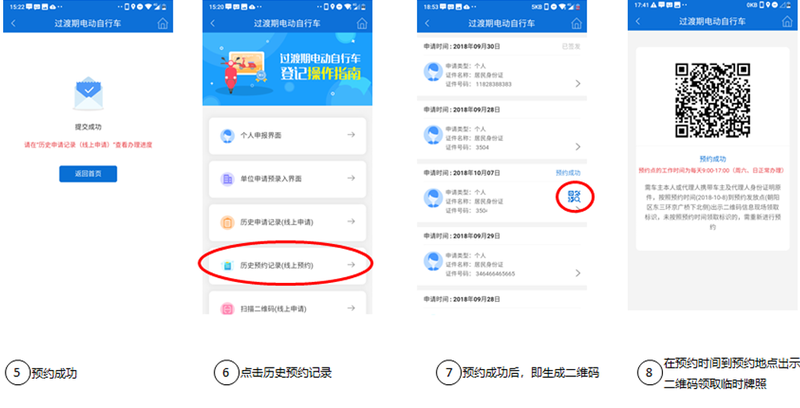 To make an appointment online, choose “线上预约，现场申请” (the right-hand option, as in Step 3 above). You will then be able to make an appointment, picking one of these Transportation Bureau offices to visit on a certain day. The system will create a QR code after you confirmed your appointment, which you show on arrival, then you can register at your appointed office with all the required materials. Although the application time for a temporary license lasts five months until April 30, 2019, riding an e-bike after November 1 without a license could lead to fines, so the earlier you get it, the earlier you can ride your bike without worrying that your bike will get impounded or that you’ll be given a ticket. The ID input only has a selection for foreign ID, not passport. Then the city of the ID (Input 4) only has Chinese cities. So a Canadian passport issued in Toronto has no place for input. Are they asking for the visa number, because my visa is issued in Beijing? You can try any of it to apply.